I went on a shopping spree in Amaretto yesterday before Amelia & I drove to the Apple Store. I’ve had these in my notebook since Lux released them. I logged on this morning to find that she’s in the ETD little store for the month of July!!!!! First up we have Celeste. Now SL fubared the purchase for me (I got a box, which wouldn’t rez anywhere, then when I logged out and logged back in it was gone from my inventory). I sent Lux an IM with the transaction # of the purchase and she replaced it right off. I’m really glad I’m not designing anymore with how SL is messing up people’s purchases recently. But Yay! for our designers who provide excellent customer service. Next up is the Ingrid dress. Very detailed neckline & keyhole. 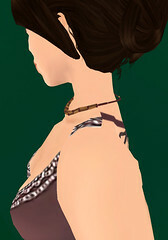 I did notice one problem with my avatar of the seams not even seeming to line up on the shoulder on the Ingrid dress. The rest of the dresses were right for me in the shoulder seams. Update: Lux has fixed this issue. Seams now meet. While I didn’t need a CPR animation, I did try to find a cast and crutches. No luck so far. This jewelry set (necklace & earrings) is something that I received as a review copy prior to the incident with the horse, but have been slow about getting to or anything else. Shown here in pale gold has color change stones. This is part of the Miriel Everyday line. Which mean’s it’s VERY reasonably priced. L$30 for one color metal, L$80 for all 4 metals. And the scripting allows you to change between 13 different stones. The hairstyle I’m wearing is the Drama from Impulse by Naughty. It’s a combination of prim styles including the sculpties. Very Nice after it Rezes. P.S. Don’t forget about the Yard Sale and the last chance to buy some retired stuff. Once upon a time there were three very different little girls who grew up to be three very different women with three things in common: they’re brilliant, they’re beautiful, and they work for me. My name is Charlie……….. 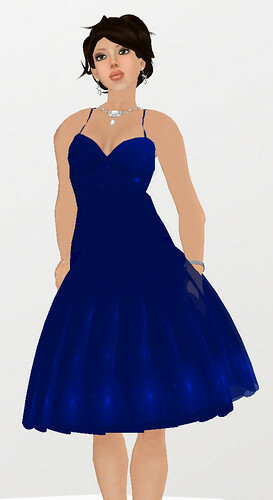 This dress is another find from Fashion Consolidated. It’s in a shop called Symmetry. 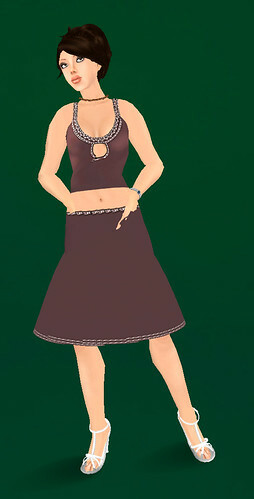 You are currently browsing the Lost Thereian – Naughty Designs category at SL Fashion Notes.